Now that my morning commute consists of rolling from my bed to the downstairs office, I’m missing one of my favorite things about the morning drive in, podcasts. I subscribe to about a zillion of them and they’re the number one reason that no, I cannot take a photo of my dinner because I don’t have any more room. The other day, as I was running errands around town, I caught up on one of my favorite foodie podcasts from Bon Appetit. I must have binge-listened to at least 10 episodes confirming my fears that not only could I spend my entire day talking about food, but listening to it as well. I think that’s the hallmark of really great food writing, if I’m driving to the store after hearing or reading about your dish, job well done. So, as I tuned into BA’s Thanksgiving podcast two weeks after the actual holiday, I was smitten with the idea of homemade mashed potatoes. They talked about simmering the potatoes, placing them through a ricer and then gently stirring in hot cream and butter. Yes, yes, yes. Suddenly, I couldn’t imagine the idea of not eating mashed potatoes for dinner that night. Thankfully, I had also binge watched enough Food Network over the weekend to know that a vegetarian Shepherd’s Pie was also in my forecast. The key to these incredibly light and fluffy mashed potatoes is a ricer or food mill. I own a ricer for my gnocchi-making afternoons, but I think it’s one of the easiest gadgets out there to produce the best mashed potatoes. Never again will you suffer from glue-like, lumpy mashers. After a quick run through the ricer, I literally just stir in milk and melted butter. This method is foolproof. You know how I feel about casserole-y things topped with carbs. In that I love them. Since soup is one of my food groups, it’s only natural that topping a thick, stew-like base with carbs is my idea of the best meal ever. (Um, see also Tamale Pie, Vegetable Stew with Scallion Biscuits). After reading this report on the myth of easy cooking, I know not to the the E word around lightly. But, for such a fancy looking dinner, this definitely borders on uncomplicated. If you can make soup and mashed potatoes, you can make this. Totally drooling over this!!!! Also – I never knew Bon Appetite had a podcast! I have to check that out. 🙂 Lately, I’ve been enjoying the new podcast by A Couple Cooks (all about food!). Dang! This looks absolutely scrummy! 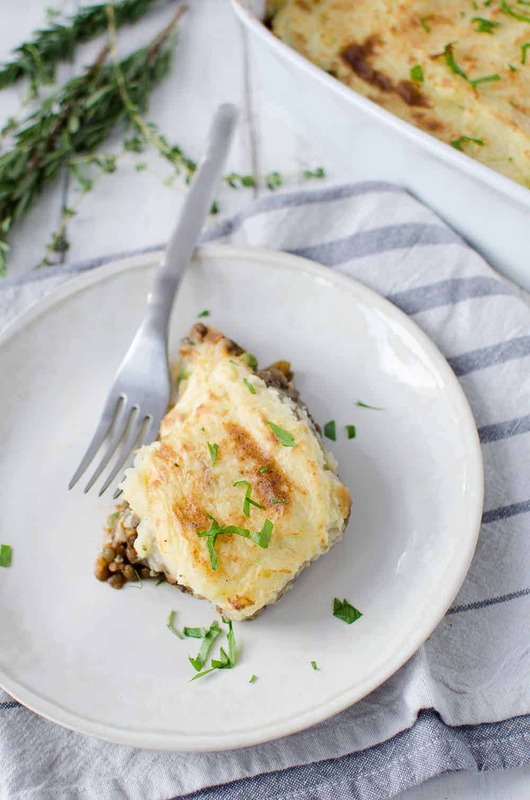 I love me some lentils…and shepard’s pie in general. Thanks for sharing, Alex! I must make! I’ve never made Shepards pie! 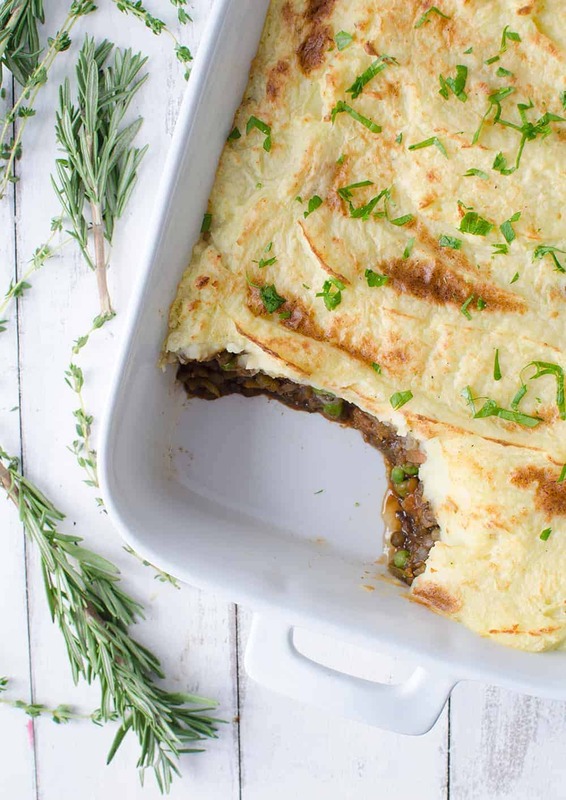 Vegan Shepherds Pie? I was so excited to click on this until I stumbled upon the requirement of “milk and melted butter” for the mash. Buzz killed immediately. This recipe, no doubt deserving of its high ranking and is probably tasty, BUT iT is not vegan and should not be labeled as such. I appreciate that someone mentioned cauliflower mash above as this will be an adequate substitute and will not require milk or butter. Sorry for the less than positive review. Hi Laird, not sure why it’s not an easily vegan recipe. 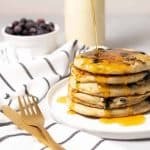 I used both soy milk and melted earth balance butter in this recipe and turned out great- and vegan! Try it! The ingredients list clearly says non-dairy butter, and non-dairy milk. Just wondering why such a fuss. II thought so at first too but gen when I read the ingredients I see it calls for dairy free butter and soy milk… it IS vegan… cheers. Uncooked! I’ll change it now so it’s clear. Looks yummy, but there are peas and tomato paste in the ingredients list that aren’t included in the directions. 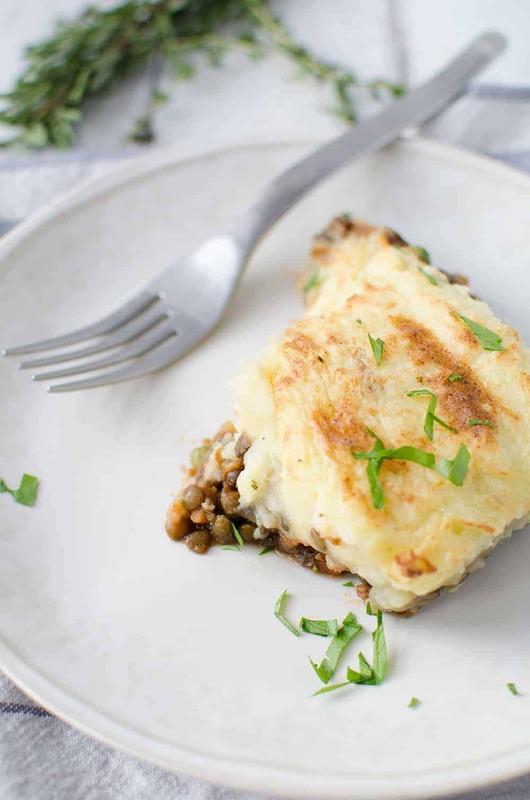 Are they mixed in with the lentil mixture in step 7? Whoops! Sorry Sabe- edited it now- thank you! Hi Aamina, yes! You’ll be broiling it, so keep an eye on it while it’s in the oven. The lentil mixture and potatoes are already cooked, you just want to brown the top. When it gets to be golden brown- it’s ready! Enjoy! Isn’t easier to measure 1 + 1/4 cups of unsweetened soy milk, than ½-3/4 cup? Or did you mean use from 1/2 cup to 3/4 cups of unsweetened soy milk? It’s 1/2 to 3/4 cup milk. I start off with 1/2 cup, then add more as needed. My third time making this dish. My family and I are hooked. Make sure you cook your lentils long enough. yummy! So glad you and your family like it! Thanks for sharing your experience. Made this tonight. Forgot the peas, but it still turned out hearty and delicious. Perfect for a chilly evening! Made this last night. I took the advice of others and reduced the amount of liquid, it calls for 4 cups , I used 3 cups. I didn’t put salt in the potatoes and wished I did. That being said it was very good, everyone like it. The longest part of the process is the chopping and dicing, but being new to eating vegan, we are finding this to be the case with a lot of meals. Will definitely make again. Such a great recipe!!! My family and I are new to the meatless dishes, this dish was so tasty. I didn’t have fresh herbs, so I used all dry. I did omit the rosemary, not a big fan of the dry version of it. Such a great recipe that you can use pretty much anything, thank you so very much. So glad you liked it! Thanks Beth! We have one vegan, one vegetarian, and one meat eater and everyone loved it. Easy to make. It was so full off flavor and you don’t miss the meat. The only bummer was that it’s not as good left over. The potatoes don’t re -heat well. Next time I will just make half the recipe 🙂 my vegan is already asking me to make it again. This recipe has become a staple in our house! 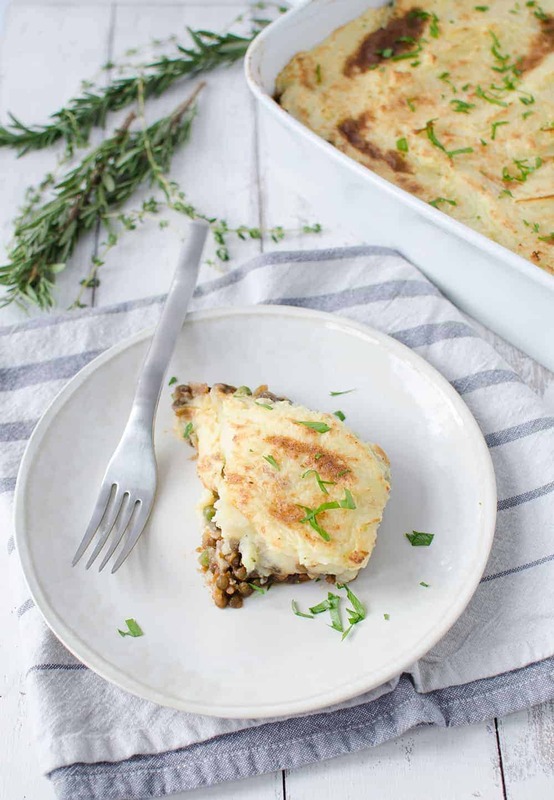 It’s so easy to make and a great healthy comfort food. I also love how much the recipe makes- I actually really enjoy it cold as a leftover too. Making this for our first vegan Thanksgiving. Do we need to soak the lentils first? My phone corrected to Alexis! Whoops! I hope you like it! It’s one of my favorites. Great recipe! I would recommend reducing the broth added by about a cup. I added a tablespoon of Worcester sauce (vegan), a cup of chopped baby Bella mushrooms, and mixed roasted garlic into the mashed potatoes. Topped with vegan gravy! Hi just wondering how much this makes.. For how many ppl? Hi Joedie, this will serve 4-6. Thanks! We have a garlic allergy can you suggest a substitute please? Hi Evie- what do you normally do? I’d recommend just removing the garlic all together. Hi Evie- I WISH I had a better response. As an Italian, garlic is literally in my bloodstream so I know how sad this must be for you 🙂 Are you allergic to everything in the garlic family? What about shallots? Or onions? I know they aren’t quite the same, but they might give some nice flavor when you leave out the garlic in recipes. Have you heard about this Indian spice called Asafoetida/Hing? I think they use it in the Indian kitchen to replace the taste of onions and garlic, and it helps digestion. The uncooked spice smells really strong, but a little bit cooked in your dish does give that extra flavour. Maybe that’s worth a try? Can this be made without ricer or food mill? If yes, how? Hi Sandeep, you can use a potato masher to make them if you don’t have a ricer or a food mill. Thanks! I’ve never commented on a recipe before but I made this last night and it was FANTASTIC. Thank you! One of the most flavorful and satisfying vegan dishes I’ve ever had. I think nutritional yeast suppose to add flavor to food. Lovely recipe! Nice and hearty, but not too heavy because of the lentils and the fact that there’s no cream or dairy 🙂 I made it twice already! The second time I made some adjustments, because I felt like the lentil stew could use a little more depth of flavour. So I swapped some of the broth for a bottle of dark ale (Kasteel Donker, a Belgian quadrupel) and I made the potato mash with half potatoes and half root celery. That made it even more awesome! 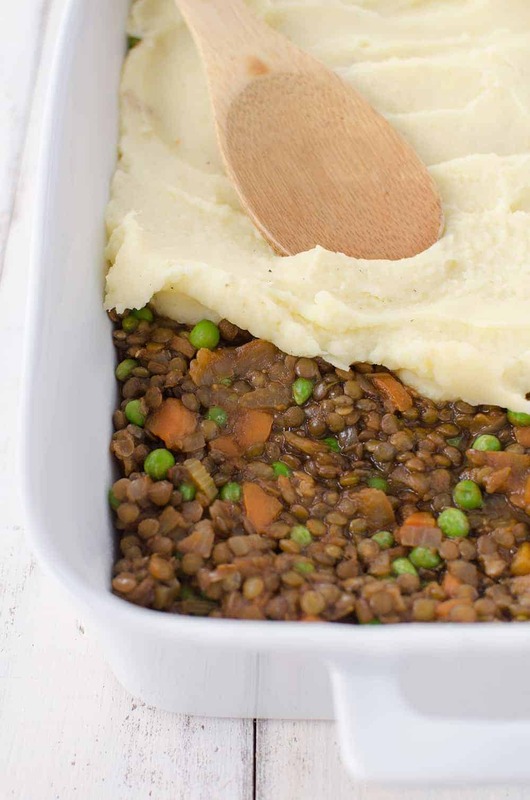 The beer gives a ton of extra flavour to the lentils. So glad you liked it! Thanks for sharing your changes! Thanks Roxane! Hope you like it! I’m new to cooking with lentils and a poor vegetarian uni student in need of some winter warming food and this was absolutely exactly what I needed – and even better enough to keep some in my fridge and keep me going on the nights where coursework takes up all my cooking time. When I had finished cooking the lentils and veg I almost ate it right there and then it smelt so good. It also made me rediscover my love of leeks, almost forgot how perfect they are in everything. Thanks so much!! So glad you liked it! Thanks Hannah! 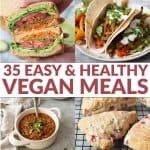 This is one of my favorite vegan recipes. It makes several servings so we have leftovers to take for lunch through the week. Today I made it for the second time. We loved it. It is a great variation from the original pie. Really delish !! Trying to eat more good protein, like legumes and veggies. This was an excellent dish! Thank you! !